Full-length collection of original poetry from Wendy Videlock, now available for order from Able Muse Press, Amazon, Barnes and Noble, Foyles, and other online and offline bookstores worldwide. Slingshots and Love Plums, Wendy Videlock’s third full-length collection, sometimes evokes the lightheartedness of The Dark Gnu and Other Poems previous to it, sometimes enchants with the frolics and insights of her Nevertheless debut. It especially shines with the brilliance of its wit, its spirituality—as in Videlock’s fiat lux invocation for her “Dear Reader” “resembling the first, or the last word.” Harnessing proverbs, myths, paeans, execrations, riddles, and pithy odes to the natural world and the people around her, Videlock delivers an inspired collection that rollicks, startles and uplifts. 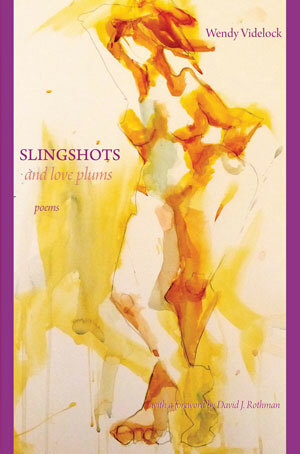 From its title to its last poem, Wendy Videlock’s Slingshots and Love Plums offers a delicious variety of treats, from witty send-ups of contemporary mores to somber reflections on mortality, love, and friendship. The pleasures include off-kilter rhymes, elegant turns, earthy revelations, and the skillful mockery of pretentiousness in its various forms. Videlock arrests because she arrests the complacent drift of sense. She is so good at it that what begins as a taste for her work can quickly turn into a craving—for deliciously cryptic spiritual riddles. Wendy Videlock’s poems in Slingshots and Love Plums sometimes hint at their Colorado origins but are never pinned down by a locality or a life story. They are gleefully universal, taking delight equally in huge abstraction and intimate real-worldliness. Whether enchanting, imploring, or arguing, they always fascinate, concentrating their acrobatics of thought and sound on the knots of the human experience. Wendy Videlock is one of the few poets I can still read at length and purely for pleasure. Playfully wise, sharp-tongued, and surprising as ever, Slingshots and Love Plums is yet another treasure to be read and reread at your leisure. Thereafter you’ll find all your thinking is rhymed—but, don’t mind: it’s just dust from the master. Wendy Videlock lives on the Western Slope of the Colorado Rockies. Her first full-length collection, Nevertheless, came out in 2011 and was a finalist for the 2012 Colorado Book Award, followed by The Dark Gnu in 2013, a book she illustrated. Her chapbook, What’s That Supposed to Mean, appeared in 2009. Her poems have been published widely in literary journals, most notably in Poetry and The New York Times.